We all know what soil is, or at least we think we do. If I were to ask you what was in soil, what would you say? Despite all the talk about limestone, to really understand the terroir of Burgundy, we really have to understand what soil is and the material from which it is eroded. The mineral component, or the part we think routinely of as soil, are typically only 45% of the soil matrix. The balance is actually 25% air, and a further 25% of water, with the last 5% being split between humus (4%), roots (.05% ), and organisms (.05). It would make sense that this percentage changes seasonally, depending on how much water is in the soil from rainfall (or the lack of it) which changes the ratio of minerals, water, and air. 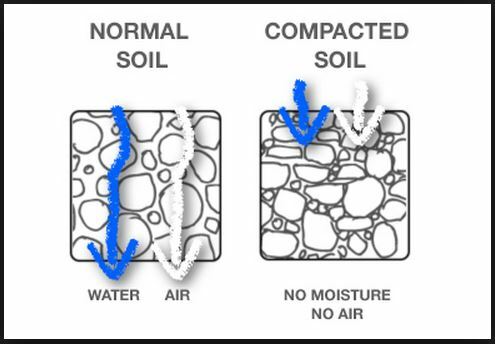 Further, these ratios can change based on soil compaction, which decreases the air in the soil, which in turn increases the percentage of the mineral and organic component. Why is this important? Because this is the environment that the vines live and they require a certain ratio of each of these components to produce high-quality grapes. 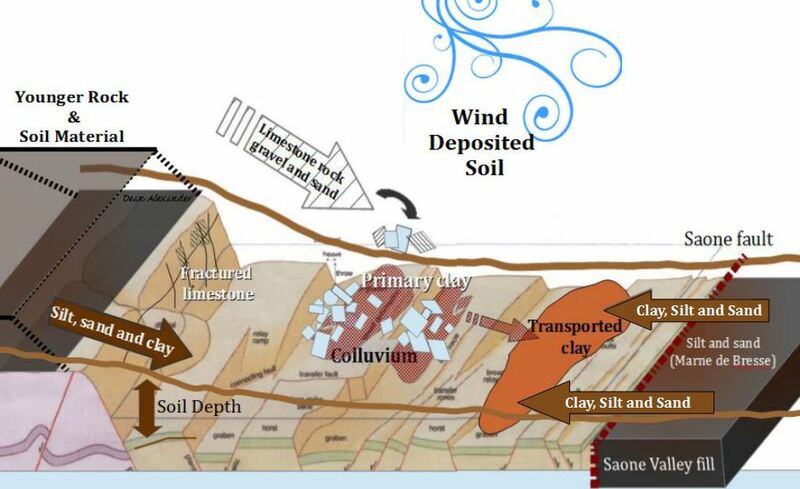 I developed this graphic to illustrate the assorted soil formation processes that affect the Côte, and are described in depth in Limestone Fracturing in Part 1.2, and from Limestone to Clay in part 2.1, in earlier articles in this series. This article, Part 2.2 Soil Formation, builds upon those earlier concepts. The French refer to the loamy Saône Valley fill as Marne des Bresse. The earth there is very deep, and typically is too wet for high-quality grape production. Historically this been used for pasture land for sheep and cattle. With every storm, this rich loam from the valley intermixes a little bit more with the soils of the boundary vineyards, and even encroaches on the loose, stony soils of the Côtes lower slopes. ‘Interfingering’, was how geologist James E. Wilson described this mixing of soils in his 1990 book, Terroir: The Role of Geology, Climate, and Culture in the Making of French Wines. 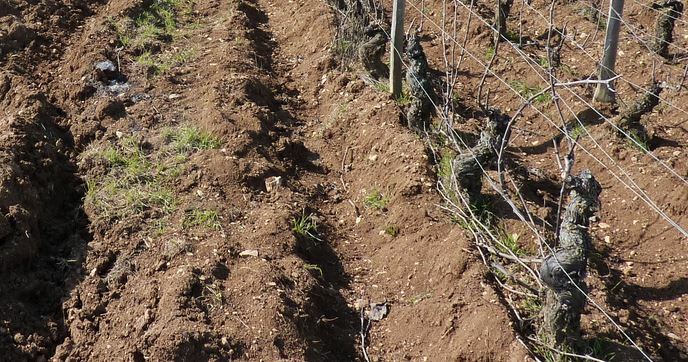 Bore samples, according to Wilson, had indicated that this interfingering has reached westward, up the hill, to influence the soil construction of the lower sections of the grand cru Batard-Montrachet. With this information, he inferred that the Saône fault must be near. It is notable that in 1990 precise location Saône fault was not known, and around Puligny, it still may not be. I suppose the wealthy Puligny vintners have no need to explain why Puligny-Montrachet is great. Vannier-Petit however, does tacitly show the Saône fault in her map of Gevrey, which is represented by the abrupt end of the limestone bedding east of RN74. Because the Côte is an exposure of previously buried, older limestone, younger soils line the divide on either side of the escarpment. The Saône Valley’s Marnes de Bresse brackets the Côte on the eastern, lower side of the slope, while younger rock and soil material that cover the tops of the hills, to the west, and beyond. From the hilltops above, those younger soils have eroded down, bringing feldspar and quartz sand, silt, as well as phyllosilicate clay minerals, to help fill in and strengthen the rocky limestone soils of the Côte. 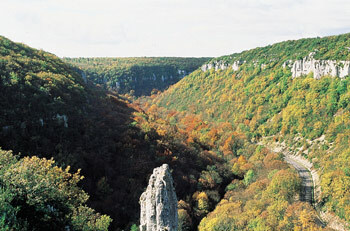 In many places, geological faulting, coupled with runoff or streams, have created combes or ravines which have allowed substantial alluvial washes to extend the planting area of the Côte. A prime example of this is the Combe de Lavaux which is a dominate feature of the appellation of Gevrey-Chambertin. It has sent a large amount of alluvial material around and below the village of Gevrey, creating good planting beds for village-level vineyards. Alluvial soils are nothing more than a loose assortment of uncemented of soil materials that have been transported by rain or river water. These materials are typically sand, silt, and clay, and depending on the water flow, various sizes of gravel particles. It is this sand and gravel that has traveled with the water flow from the Combe, that provides these vineyards that protrude past the limestone of the escarpment the drainage the vines require. These are not, however, the soils that will produce the great premier cru, or grand cru, wines for which Burgundy is famed. While it is easier to see how a graded bed might be created in a stream bed below a ravine like the Combe de Lavaux, I was somewhat perplexed how this might occur in Alex Gamble’s Les Grands Champs vineyard in Puligny-Montrachet, see Clay part 2.1. Here gravel bedding lay at 80cm, a little more than two and a half feet below the surface. Above the gravel, sat a foot and a half of heavy, yellow, clay-dominated soil. This was, in turn, topped by nearly a foot of loamy-clay soils. Vannier-Petit estimated these soil horizons, as geologists refer to them, were created between two and five million years ago by water runoff. What kind of run off? I realized that the kind of runoff that creates graded bedding happens often, like in this photo (below), taken in Pommard during the winter/spring of 2014, by winemaker Caroline Gros Parent. 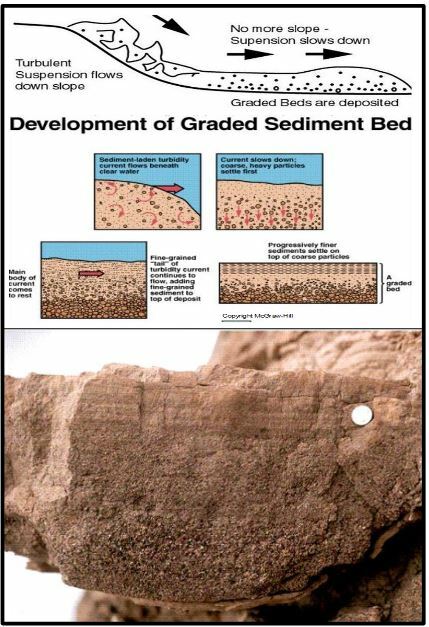 Geologists talk about a soil’s parent material because every element of soil came from a different material, which was then weathered, both mechanically and chemically, into various sizes. These minerals will then accumulate, either poorly sorted into an aggregate material, or they can be well sorted by the wind, water, or gravity into size categories. Sand and silt are generally said to have been created by mechanical weathering, although chemical weathering is always a present force, as long as there will be rain. Sand can be made of any parent rock material, but in Burgundy, there are sands made of granite, in addition to plentiful limestone sand. (2) We know this because there is loam present (as well as graded bedding), in the Grands Champs vineyard from the Saône valley fill below. The water that carried this non-limestone, Côte-foreign material, would have carried quartz sand with it as well when it created the graded bedding there. This gives us a very important insight into the construction of the soils of Burgundy. Fine Earth Fractions are the trinity of sand, silt, and clay. Gravel and sand can be made of limestone or other rock that has been weathered into smaller and smaller pieces, but silt is typically feldspar or quartz. Clay is much, much smaller in size, and is created by chemical weathering of rock. Its parental material can be limestone, granite or other stone. Geologists grade soil minerals by size; the basis of which are particles that are 2 mm and smaller. These are called fine earth fractions and consist of sand, silt, and clay. In equal thirds of each of the three soil fractions is considered perfect for farming crops, and is termed loam. The various sizes of minerals in the soil makeup gives the soil its texture. Clay, we have talked about in length in part 2.1, and differs from silt and sand because it is a construction from stone that has been chemically weathered, whereas silt and sand are derived from mechanically weathered rock. Additionally, clay is a construction of clay minerals that are bound with aluminum and oxygen by water and carries minerals within its phyllosilicate sheets. It is also important to mention that clay’s particles are considerably smaller in diameter, being less than 2 microns in size. 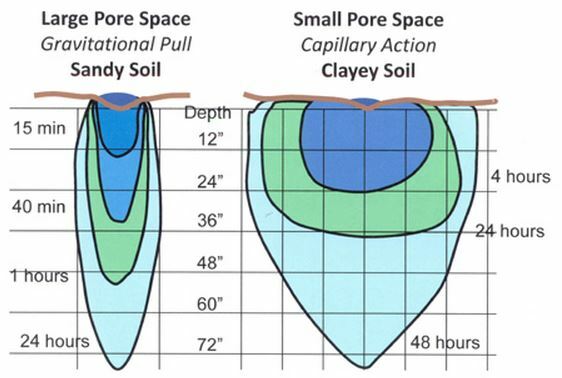 Soils with more clay hold more water, so they require less frequent application. An overabundance of water in clay soils causes oxygen depletion in the root zone. This can limit root development. The abundant solvent calcium in the limestone soils Burgundy misaligned the clay platelets, loosening the soil, and allowing better drainage. 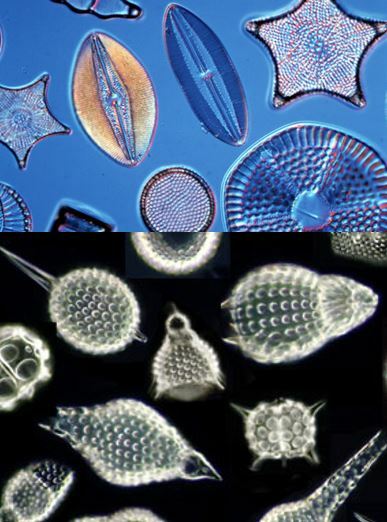 Diatoms (top) and bottom, fill the ocean floors with sediment. Silt is specifically formed from quartz and feldspar, and is larger than clay, being 0.05 mm-0.002 mm. We know that any feldspar in the soil, could not have come from weathered stone; neither limestone or granite, which was the dominant stone in the area when the limestone beds were forming, because it would have metamorphosed into a phyllosilicate clay mineral if it had. This means the feldspar has traveled onto the Côte, either from above or below the limestone strata. 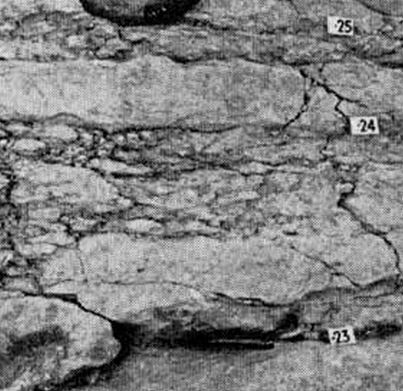 While it might seem logical to assume the quartz in silt originated in the earth’s crust, and perhaps degraded from granite that was prevalent in the area, this may not be the case. The first problem is quartz is resistant to chemical weathering. And physical weathering like frost wedging of sand particles may continue to yield results beyond a certain size. Researchers from the University of Texas at Arlington used (and I cut and pasted this) a “backscattered electron and cathodoluminescence imaging and measure oxygen isotopes with an ion probe.” They found that the 100% of silt quartz found in 370 million-year-old shales of Kentucky were made from the “opaline skeletons” of plankton, radiolarians, and diatoms. This, they reasoned, might explain the lack of these kinds of fossils during the same period. These tiny animals had all been incorporated into the then forming shale. This may also be the case for the silt quartz of Burgundy, itself too having once been a Jurassic, seaside resort. This, in fact, this information also suggests this quartz silt may come from weathered shale that is much older than the limestone of the Côte. 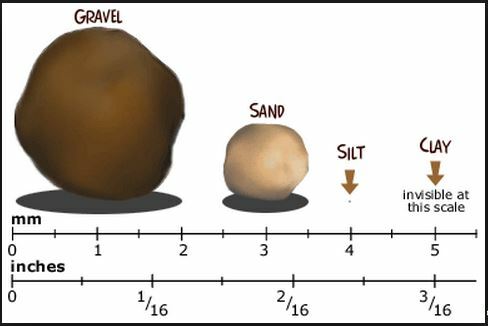 Sand is larger than silt. being less than 2 mm, and typically is constructed of quartz or limestone particles. The limestone sand will weather to solvent calcium carbonate, but the quartz will not weather and will remain as sand. It is likely that significant quartz sand has been washed down from the hillsides, and certainly is a major contributor to alluvial soils below the combes. Sand drains so quickly that vines grown in sandy soil have more frequent water requirements, but require a lesser amount of water. Adequate water maintains plant growth while minimizing the loss in the root zone. Grasses, with their dense root systems, are positively impactful to the topsoil. 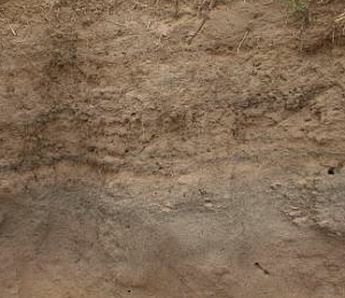 In their decomposition, darker soils are created to deeper depths, and the resulting soils also tend to be more stable. In a monoculture of grapevines, many growers are finding this to be a significant advantage. In Australia, some grape growers are using grasses to help lower soil temperature in efforts to slow down ripening in an ever-warming climate. Much is made by those practicing sustainable and organic cover crop encourage populations beneficial predator insects and birds, but grasses and cover crops also encourage subsoil organisms and microorganisms growth as well. Most common are bacteria and actinomycetes (rod-shaped microorganisms), which by weight have been found to be four times more present by weight than earthworms in healthy soils. While these are important to the quality of the wine, they are only an intricate part of terroir if it is practiced by the farmer. The proper amount of airspace between mineral fragments is very important for vine growth and allow for water to penetrate and be retained by the soil. Soils with diminished airspace are said to have soil compaction, and compaction is difficult to correct once it has occurred. The Overly tight spacing between the mineral component of a soil restricts oxygen levels and contributes to a poor water holding capability. Rainfall itself can cause some soil compaction, but most commonly walking or operating farming equipment on moist soils does the most damage. In drought years, soil compaction can lead to stunted vine growth and decreased root development. In wet years, soil compaction decreases aeration of the soil and can cause both a nitrogen and potassium deficiency. Additionally, without adequate porosity to the soil, water cannot easily penetrate the soil during a rainstorm. Water that cannot infiltrate soils of flat terrain can stagnate, which further compacts the soil, or on sloped terrain will runoff, which can create erosion problems. 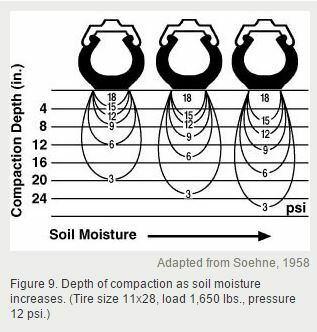 As moisture of the soil increases, so does the depth of compaction. Moderate compaction can have some desirable effects. Moderate compaction forces the plant to increase root branching and encourages secondary root formation. This additional root growth is the plant’s response to not finding enough nutrients with its existing root system. Plants with more extensive root systems are more likely to find nutrients that are not carried by water, like phosphorus. Obviously, more compaction is not better, because it impedes root growth, lessens the oxygen in the soil, and repels water from penetrating the soil. While deep tillage 10-16 inches can shatter the hard packed soil, studies have shown that crop yields will not return to normal following the effort. While there are factors that might cause the soil to return to compaction, like a farmer, unintentionally re-compacting their soils, more than likely tilling does not return the airspace that was lost in the soil itself. Further continuous plowing and tilling at the same depth can cause serious compaction problems on the soil below the tilling depth. It should be impossible to talk about soil without talking about water, given it is optimally 25% of soil’s makeup. It is certainly tempting to pass over the subject of groundwater and lump it into erosion, but that would really shortchange our understanding of the Cote. Part of Burgundy’s success can surely be attributed to relatively steady rainfall year round, coupled with the fractured limestone’s ability to hold water until its reserves of water which is held within the stone can be recharged by future storms. Good drainage, well-drained? Let’s reset the dialogue. The infiltration of rainfall by the soil is the first and perhaps most important factor in recharging groundwater levels. Like I wrote of compaction, the soil has to be porous enough to penetrate the topsoil and subsoils successfully. The buzz word in the wine world is drainage, with terms like well-drained, and good drainage appearing often. I suppose we picture the roots drowning in mud if there isn’t good drainage. But the idea of good drainage really simplifies the issue. Drainage can have to do as much to do with compaction as soil materials or slope. Soil drainage is important in fighting erosion as well not causing additional soil compaction. Good drainage, which is what happens with a well-aerated soil, allows the vines roots sufficient oxygen and nitrogen and allows the roots to take in nutrients like phosphorous and potassium. But none of this can happen if the soil releases rainwater too quickly, and the vine can perform none of these vital tasks. The reality is, it is not the fact that a soil well-drained, but rather it drains at the adequate rate for a given rainfall. Obviously, this will not always be a perfect equation since rainfall varies greatly depending on the year and the time of year. The kinds of materials that make up the soils contribute greatly to the rate of water ability percolate through the material. The speed of the mater’s movement depends on the path the water is channeled in. The most direct path that is in line with gravitational pull will give the fastest drainage. Water movement comparison through sand and clay. Source Coloradostate-edu. Sandy soils, as one might expect, drains quickly because it consists of only slightly absorptive, small pieces of stone, that allow the water to essentially slide right past. Clay, on the other hand, is very dense and plasticity. These characteristics, as you might expect, would be resistant to allowing water to pass through, and large bodies of transported clay can redirect horizontally, the flow of water percolating through from above due to it’s slower absorption rate. But what isn’t obvious is that clay’s construction encourages capillary action. The clay body will distribute water throughout its mass, counter to gravitational pull, becoming completely saturated, before releasing excess water through to the material below. Highly fractured limestone that is still in place, is often is fragmented in a prismatic pattern. However some limestones, like this soft argillaceous limestone to the right, with its high clay content, may fracture horizontally. The type of fragmentation would depend on the stresses upon the stone, the freeze-thaw effects of water and temperature, as well as the material of the stone’s construction. Clay based stones will tend to fragment horizontally and when they do, they are considered platy, and water will percolate more slowly than stones that fracture in a prismatic fashion. The hillside of the Côte is a recharge area for water collection, while the valley below is a discharge area, where excess water is expelled. The water table is at the capillary fringe. 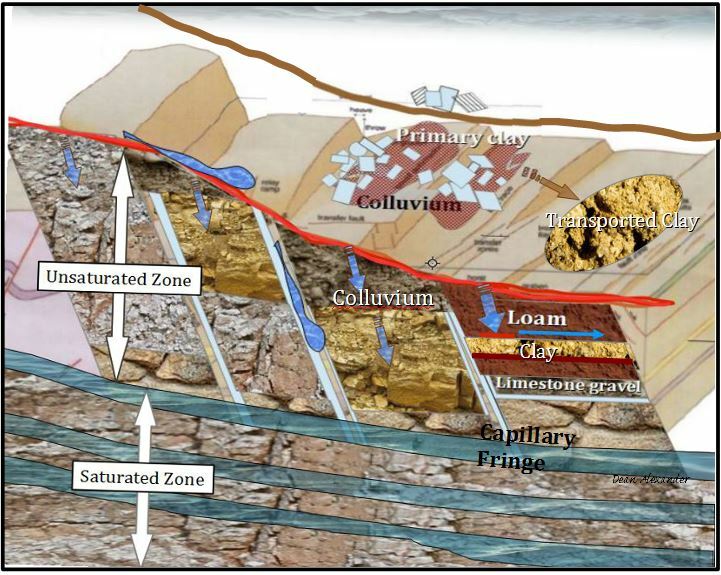 Water uses faults and fissures to move quickly into and out of the saturated zone. 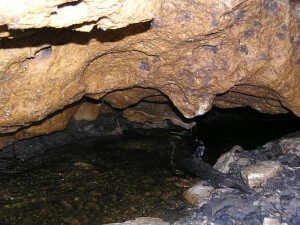 It is likely there are aquifers, meaning caves which have been cut out of the limestone by carbonization below the Côte, where the water is stored. In writings regarding Burgundy, very little is said about ground water, other than there are no cellars built underground in Puligny because the water table is too high there. A plentiful water supply may be one of the features that propel the vineyards of Puligny into the ranks of the worlds best. As my diagram above shows, water percolates through the soil and stone. This upper section is called the vadose zone, or unsaturated zone. Slabs of limestone, fissures, faults, and clay bodies all can change the course of the water flow. Each horizon of soil and each layer of stone have their own rate of percolation. With this much limestone, it is very likely there are karst aquifers or large caves caused by the carbonization of calcium carbonate beneath the Côte, but I could find no specific mention of aquifers in close proximity to the Côte. There is a mention in a European Academies Science Advisory Council‘s country report for France, that in Burgundy there are “karsified Jurassic limestone layers” somewhere in the region, but nothing more is elaborated upon. There is a very famous and massive karst aquifer with seven very deep layers that spans from north of Burgundy across the Paris basin to the English channel. The deepest level of water is brackish. The uppermost section is called the Albian sands sits at than 600 meters, and was first was drilled into in 1840 taking well more than 3 years to achieve. The water there is 20,000 years old, and there has been discussion whether the water should be considered fossil, meaning there is a question whether there recharge from the water above, or not. (1) Interestingly, larger stones, especially the flatter, rounded shaped stones that the French refer to as galets, tend move to the surface, probably because of their larger displacement values. (2) Sand from other parent rock material is likely to be available as well.